Firstly, I must apologise for my lack of online presence. As I have just discovered, I have not written since July 9th. I have had the very best of intentions to bake and create new yummy recipes since July but somehow life has just gotten in the way. I have spent too much time pondering the reasons behind everything in life and not enough time in the kitchen. The last ten months have been excruciating! In the first few months after we lost our daughter Elena, I tasked myself with long ‘to do’ lists every day to get me through our loss. I baked, I wrote, I cleaned and I did minor house renovations to occupy my mind. Then I went back to work. Returning to work after six months, seems to have been the hardest part of dealing with my grief. I suddenly didn’t have the time to do my necessary grieving. I was so tired and still am, from having to put on my brave, happy, smiling face and pretend to the world that everything was ok. I spend all day every day fielding questions from customers asking how I am and assessing which version of the truth to give them. And it became ‘normal’ to just pretend that I am fine. I smile and just carry on and ask others about themselves so to avoid having to share my own little lies and sadness. So when I come home, all I want to do is hide. I hid myself away and did what I needed to carry on with the next day, weeks and months. I have tried to cook and bake. Somehow it just didn’t seem important anymore. Of course, we’ve had home-made dinners for the most part, but I relied on my gorgeous husband to be, to do more of the simple evening meals and then for the days we both had no energy, take aways became our friend and saviour. In the last few weeks, I realised that I have to try. I have to try to be a bit more like the old me and start dreaming again if we are going to have any kind of happy future. It seems impossible to be anything like I was, but I want to try to be an improved version. I now have a reason. I am pregnant with our second child. And I don’t want to become a mother who sits around all day feeling sorry for herself and not fully living. We are blessed, with being Elena’s parents and now with her younger brother or sister. So you see, I must continue on. My way to do this, is to go back to my ‘to do’ lists and force myself to breathe again. 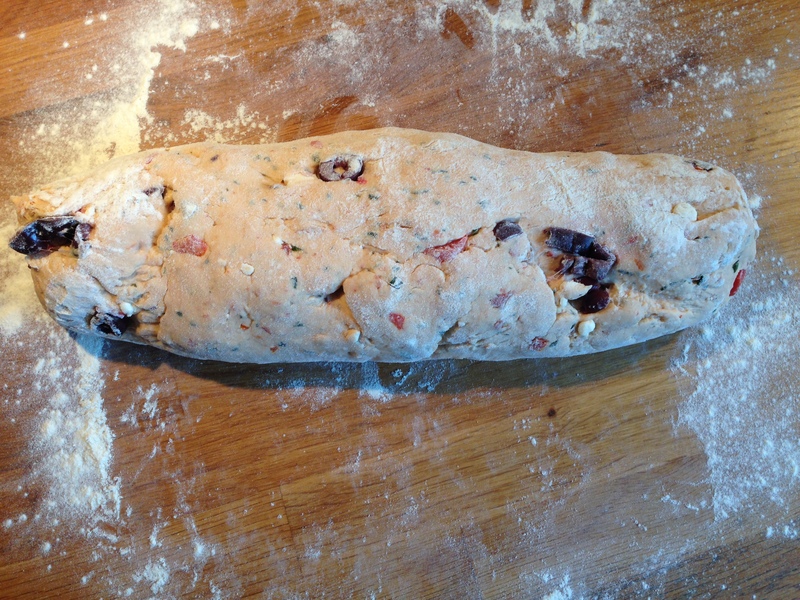 Starting with my Greek feta cheese and sun-dried tomato bread! Sorry for rambling on, but I do hope that you try this and enjoy making this recipe. It’s perfect for the festive season coming up and damn tasty! This is quite a basic recipe (although it does take quite some time to make) and it’s up to you and your taste buds whether you add all the ingredients. Some people aren’t fond of feta so I would suggest leaving it out and just adding a little extra cheddar, the same goes for the olives. It’s not an oozy cheesy bread, but more that the cheese lends an enhanced flavour and bite to the bread rolls. 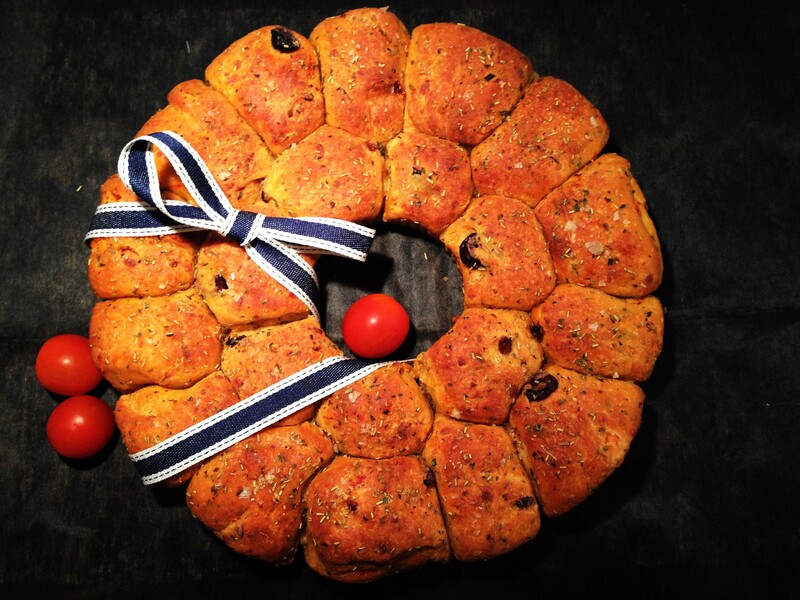 I have made this in a normal baking sheet in linear lines, but also for a more decorative and festive approach I make this in a wreath shape for the dinner table. Get all your ingredients weighed and organised. This way the actual hands on time is much less and feels a lot neater too. I use a stand mixer for this but you can do it by hand too if you don’t have a mixer. Sift the flour, salt, sugar and yeast together. 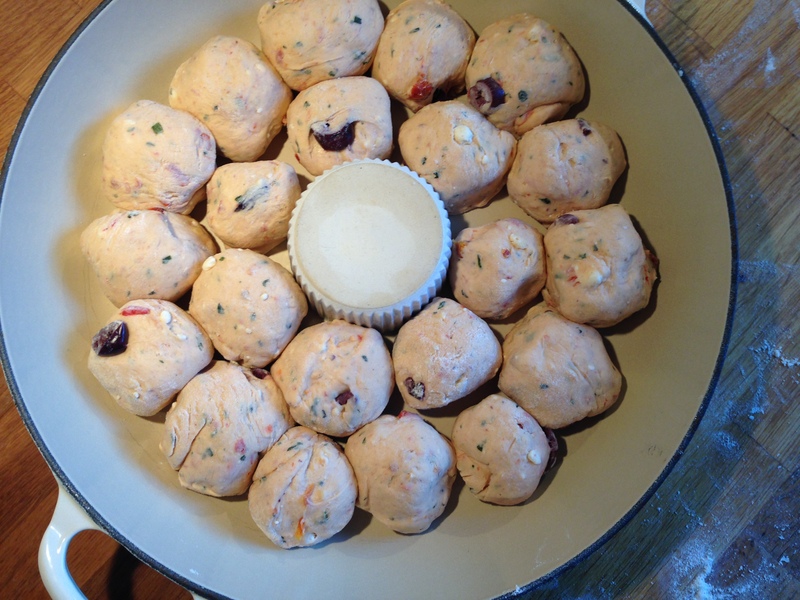 Make a well in the centre of the mix and add the water and sun-dried tomatoes to it. Mix together until a slightly sticky dough comes together. Put the mixer on to knead for about 2 minutes or you can turn the dough onto a floured surface and knead by hand. 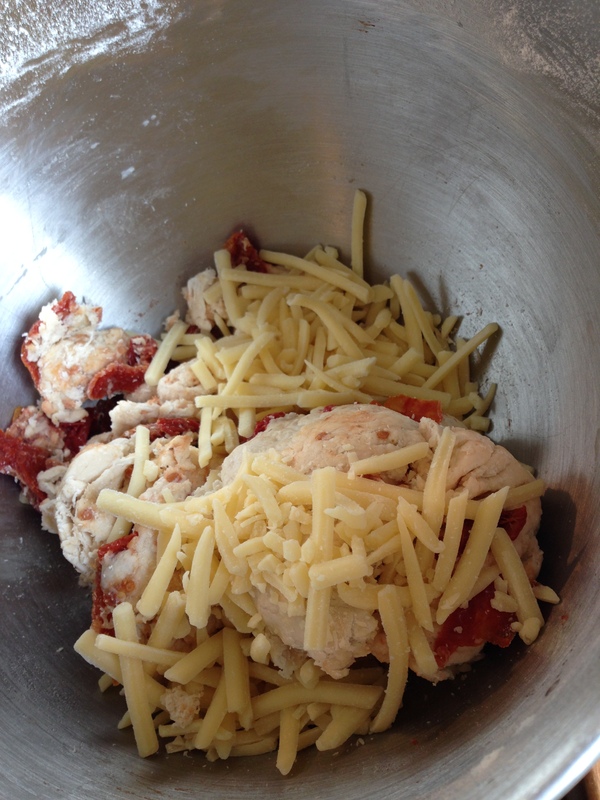 Add the grated cheese and continue to knead for another 2 minutes. 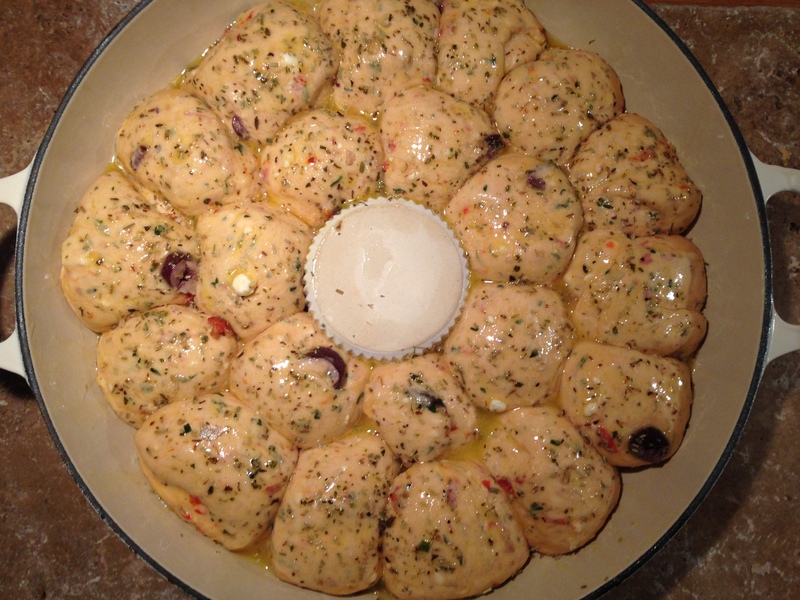 Once the dough looks a little smoother and elastic, add the feta cheese, olives and fresh herbs to the mixer. 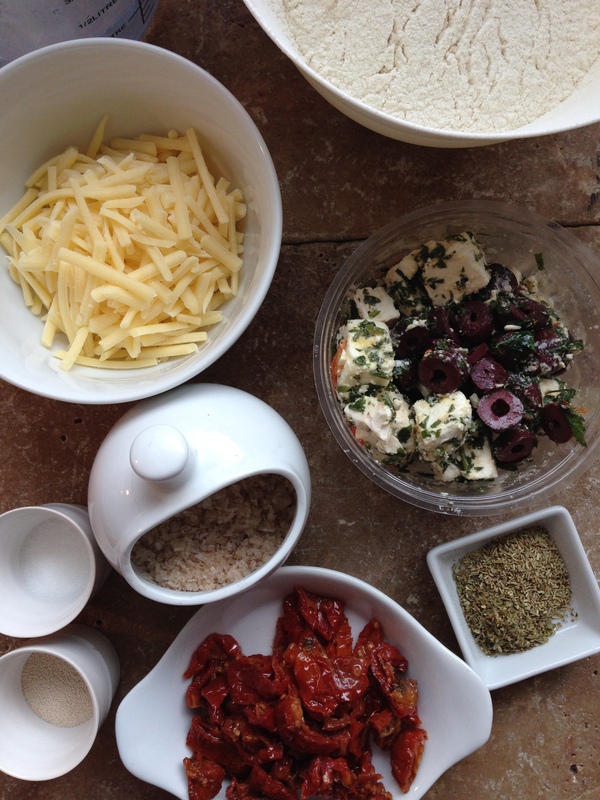 If you aren’t using a mixer, crumble the feta, herbs and olives over the dough and incorporate by hand. 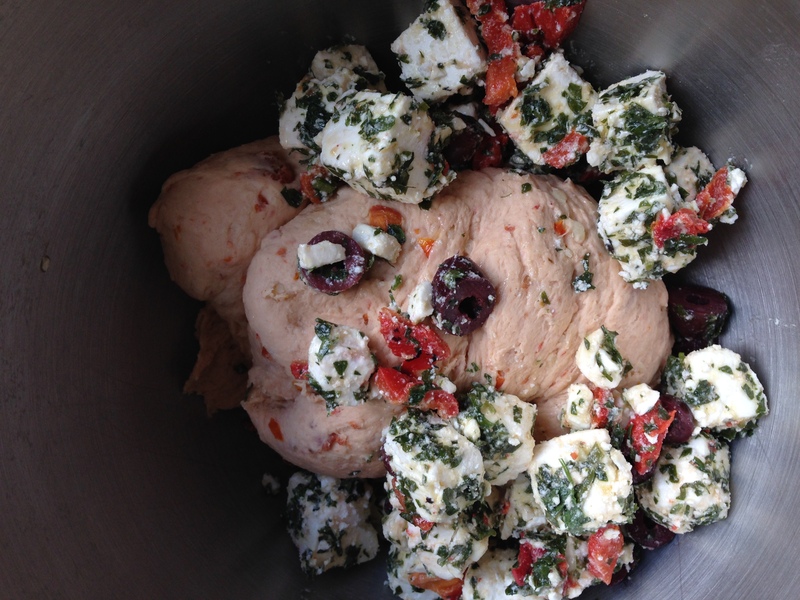 The kneading will break up the feta so don’t worry about massive lumps of cheese in your dough. But because of the added ingredients, the dough will be a little lumpier than your basic white dough. After a total time of kneading (about 8-10 minutes), cover your dough with cling film or a wet cloth and leave in a warm place to double in size. If you are like us and have a drafty and chilly old house, put the bowl on top of a warm hot water bottle and leave for about 1 hour. Once the dough has risen, gently slide it from the bowl onto a floured surface. Don’t over handle the dough or the air will be lost and the dough will deflate. Gently make a uniform log shape and cut with a sharp knife into roughly 20 similarly sized dough pieces. 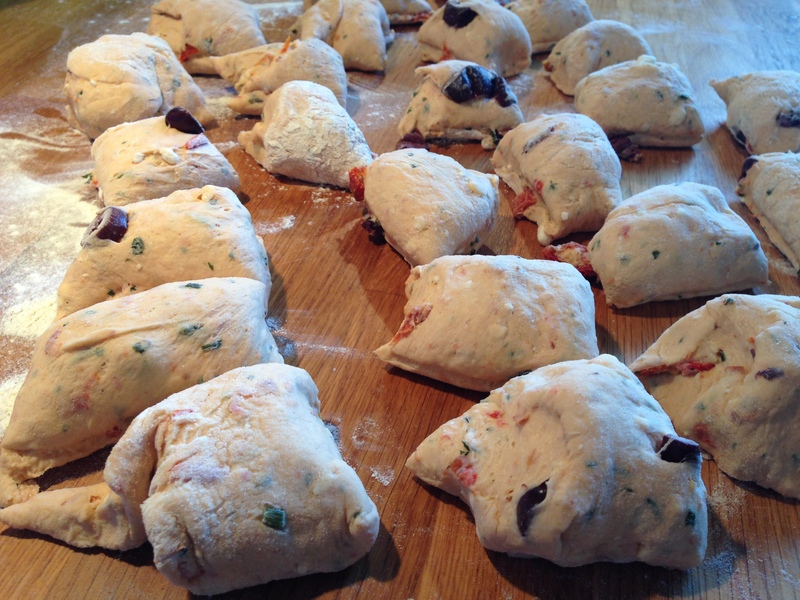 With one hand gently cup each piece of dough and roll on the floured surface until round and ball-shaped. Once all the balls are smooth and even, choose what pan to cook on. 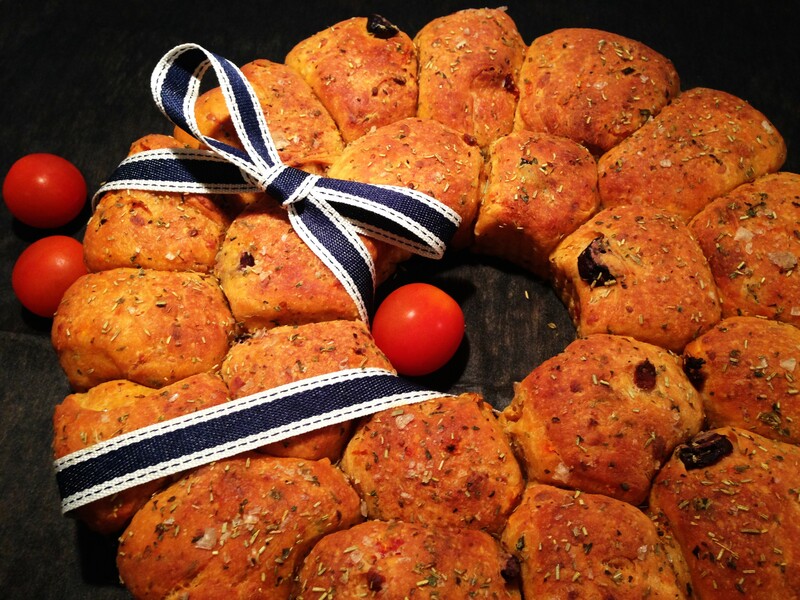 Either make a wreath shape by placing a small round oven proof ramekin in the centre and place the dough balls around it (I use my shallow casserole dish as my base) or use a baking sheet and form a linear pattern. Be careful to leave 3-4 mm between each ball allowing it to rise again in the next stage. Brush the top with half the melted butter and sprinkle 2/3 of the dried oregano and rosemary on the top. Leave to rise again for about 1.5-2 hours until the gaps are filled and the dough looks nice and plump. Brush with melted butter again and season with the flaked salt and remaining dried herbs on top. Pop into a preheated oven (190 C/170 C fan oven) for 35 minutes. The outside should be golden brown and the bread should still be light a fluffy and not too over baked and hard. This is really a yummy bread and just perfect for sharing, plus there is no slicing involved and therefore no pesky crumbs all over your kitchen!